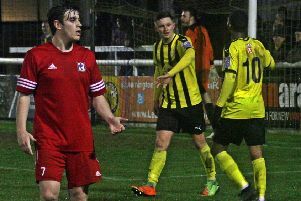 Trea Bertie scored twice as Racing Club Warwick got back to winning ways at Cadbury Athletic. A late Cadbury goal could not take the gloss off a first win in three for Racing Club Warwick on Saturday. 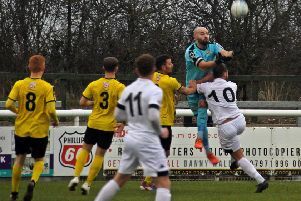 Trea Bertie scored both the visitors’ goals and manager Scott Easterlow said his patched up side deserve credit for getting through a tricky fixture. “It has been a bit of an unlucky ground for Racing over the years so it was good to get all three points, especially with our squad stretched at the minute with injuries, illness, suspensions and so on,” said Easterlow, who was forced to employ striker Wade Malley at left-back. Racers’ Luke Cole had a header cleared off the line early on before the dangerous Odane Barnes dragged a shot wide for Cadbury. The frontman then looked like he was going to put the hosts one up but a fine stop from keeper James Behan, in for the suspended Charlie Bannister, kept it goalless. It was against the run of play that Racing Club opened the scoring just past the half-hour mark. A fine run from Ben Mackey ended with a shot that was well parried by the keeper and Bertie was on hand to thump home the loose ball. Just a few minutes later it was 2-0. A superb drop of the shoulder in midfield from Henry Leaver and a precise through ball to Bertie resulting in a shot into the top corner from 25 yards. Barnes eventually got his reward, firing home in the 91st minute for Athletic.